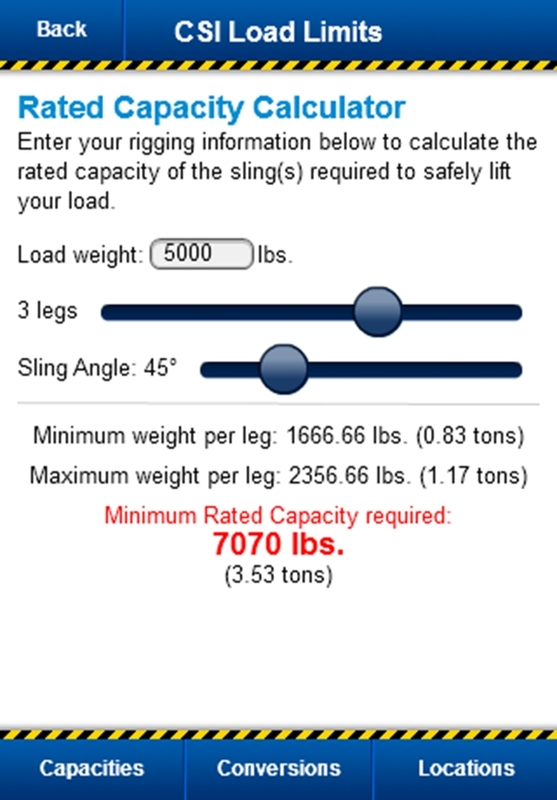 The Certified Slings & Supply Load Limit application provides written industry standards for safe overhead lifting and rigging configurations in easy to read charts and text. Instantly know the working load limit for alloy chain, synthetic, and wire rope slings. Certified Slings & Suppy has created an interactive app for overhead lifting and load limts charts and definations for both the iPhone and iPad. 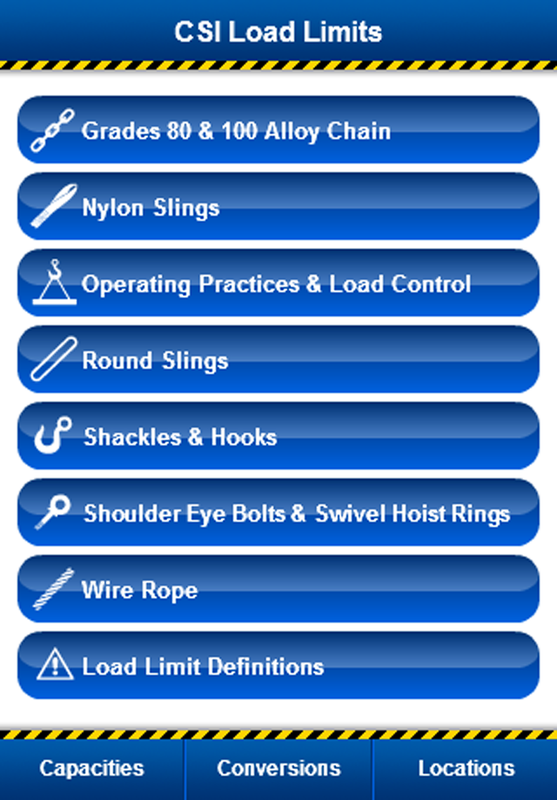 The Certified Slings & Supply Load Limit application provides written industry standards for safe overhead lifting and rigging configurations in easy to read charts and text. Instantly know the working load limit for alloy chain, synthetic, and wire rope slings. Additionally you will be able to quickly review the vital hardware specs for shackles, hooks, eye bolts, and hoist rings. This application is a must for anyone involved with overhead lifting. This application takes the place of printed load limit charts popular with on-site safety directors, crane operators and rigging professionals. Additionally, a toll free number is provided, linking you to Certified Slings & Supply an award winning manufacturer of overhead lifting supplies with over 50 years of professional experience in the industry. Get the information and expertise you need to make safe and efficient lifting decisions in one easy app. The app can be downloaded at the Apple’s iTunes store for .99 cents. Established in 1958, Certified Slings, Inc. is an award winning manufacturer, distributor and retailer in the State of Florida. Products include: wire rope, chain and nylon web slings, safety and fall protection equipment, lifting and hoisting assemblies, cargo tie downs, excavator/drag line buckets and replacement parts. Certified Slings is the Slingmax® Rigging Solutions Dealer for Florida with locations in Tampa, West Palm Beach, Fort Myers, Miami, Orlando and Ocala. email jflowers(at)certifiedslings.com or call (407) 331-6677.